Know your audience. This book tries to be a lot of things to a lot of people, and never quite succeeds. If you do persevere through the book, you will be rewarded by some nuggets of useful information. You really have to get past the opening. The authors seem almost determinedly intent on putting off the reader at the beginning itself, when they talk about attraction between people in a romantic, life-partner, chance-rendezvous turning into a romantic affair manner, and almost set the narrative in this context. This is not what the book is quite about. There seems to be a lot of useful material on how people communicate with each other, empathize with each other, and how bonds of trust can be made to grow when people interact. The more you know this the better the chances that you can turn speaking with people into something that's more productive. We all know what we mean when we or someone says "we clicked", so do we have to define it as "... an immediate, deep, and meaningful connection with another person or with the world around us."? And "click accelerators", "quick set intimacy"??? In the modern day and age of casual relationships, do we really need more information and tips on how to form relationships with the seeming click of a finger? Well, the authors tell you how to do just that. By telling us that there are five click accelerators. The way these click accelerators are described seem very awfully close to the methods employed by cultists to attract and then retain members into their cults. Not a very wholesome comparison. A lot of research is thrown our way, but almost all of it has to do with experiments conducted by psychologists. Not much by way of academically accepted theories that can credibly explain why we behave. Sorry, but this book just didn't click for me. Influence: The Psychology of Persuasion still remains the best book on this topic, on how to influence people. Read that book instead, or re-read it. I guess this would qualify as a "wideload" on our highways. Taken on NH46 (see the tag NH46 for more photos of NH46, and this post, To Pondicherry, has some nice photos of NH46 I took in 2009). I am a big fan of such milestones. On NH46 there is one milestone marker that actually marks the distance to Mumbai (Bombay) as 1000kms. So why don't I have a photo of that? Well, it's a long story. Successive milestone markers don't mention the distance to the same city. See? But Where Is The Climax? Like Grisham stopped typing and decided to finish the novel (almost) mid-sentence. If you accept and believe this to be a novel meant for pre-teens or tweens, even then this is still weak. 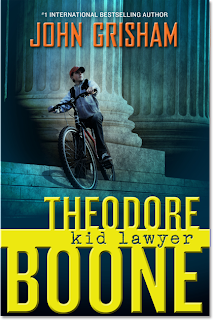 Theodore Boone, Theo for short, is a 13 year old teenager, is the son of lawyer parents, has a more than keen interest in law, sees himself as a trial lawyer when he grows up, often helps out his school mates with legal troubles. When a murder trial starts in his town, he is obviously interested in following it. Which he does, even arranging with the trial judge to have his class attend the first day of the trial. When Theo is introduced to a cousin of a low income student that he teaches, and who may be a crucial witness to the murder, Theo is caught up in a dilemma as to what to do. To tell his parents, or his Uncle Ike, or the judge, or the police. What complicates matters is that the trial is about to come to an end in a matter of a few days, and more importantly, the witness is in the United States as an illegal immigrant, and is therefore not willing to go to the police for fear of deportation. The premise is interesting, and promises lots of thrills, suspense, and action mixed with the innocence of youth. Except the premise remains a premise. The plot never goes anywhere. There are no surprises. No twists. No suspense. Nothing at all. The novel JUST ENDS. I actually turned over the last page more than a few times, expecting to read more. There was nothing. I checked online on Amazon.com to see if a page or more had bee torn from my copy. No. That's it. Hugely disappointing. From any author this would have deserved 3 stars at best. Coming from Grisham this deserves a low 2 star rating, if not a lone star. This book reeks of an assembly line mentality, shoddy workmanship laden writing. Yelagiri is a small nondescript hill station off the Bangalore - Chennai NH46 national highway. It ranks second to the other hill station near Bangalore, Yercaud (see my posts on Yercaud). If you want a short, relaxing weekend away from Bangalore, either of these two hill-stations will do. Yelagiri offers even less than Yercaud, but this is not to say that there is nothing to do there. There is the lake, a garden, and some short treks. There is also a musical fountain, which is sort of unique as you don't generally find musical fountains at hill stations. The musical fountain is a recent addition. Speaking to the people there, it seems it was mostly the result of an enterprising bureaucrat who made sure that the funds allocated towards the development of Yelagiri as a viable tourist attraction were put to good use, and in good time. Yelagiri (Tamil: ஏலகிரி) is a hill station / village in Vellore district of Tamil Nadu, India, situated off the Vaniyambadi-Tirupattur road. Located at an altitude of 1,410 metres above Mean Sea Level and spread across 30 km2, the Yelagiri village (also spelt Elagiri at times) is surrounded by orchards, rose-gardens, and green valleys. The road from Bangalore to Yelagiri is excellent. With the completion of the last remaining flyovers on NH7, the drive from the Bangalore Silk Board is uninterrupted by diversions that existed hitherto. From NH7 you need to take a left at Krishnagiri on to NH46, the tolled highway that takes you to Chennai. At Bargur you take the state highway that takes you to Yelagiri. The drive up to Yelagiri is pretty good, with 14 hairpin bends to be navigated. How do I know there are 14 hair pin bends? Because these are very neatly numbered such. While the temperatures are only marginally lower than the plains, the abundance of trees and the green cover makes the heat much more tolerable than in the open, where the sun beats down upon you, mercilessly. As you enter proper Yelagiri, you are greeted by good pavements, proper lane markings on the road, and lots of signs to give a first-time visitor information on the things to do at the place. Very thoughtful, and to be much appreciated by travelers. As I wrote above, this is one of the 14 hairpin bends when going up to Yelagiri. This is the intersection on NH46 where you need to take a right onto SH131. The flyover you see in the background is NH46. Photos from the Bangalore Book Festival. The festival is open till Sunday, Nov 21 2010. If you take your car there, you need to pay Rs 20 for parking. Entry costs Rs 20 per adult. See my earlier post, Books, Photos, and Travels: Bangalore Book Festival 2010, for more details. One thing's for sure. If you want to do justice to the book festival, you need to budget at least half a day. That's right. Six hours or more. Maybe even a full day. You may not end up stopping at every single stall, but there will be a dozen or so where you will want to spend some time. And yes, one more thing. A few thousand rupees in your pocket may not be a bad idea. At these book festivals, the chances of stumbling upon a book that you had been searching for, or one that had recessed into some long, forgotten crevice of your mind are high. With the advent of the internet, powerful search engines, book previews that can show you snippets of books, and shipping options that can land that desperately sought book at your doorstep in a matter of days or a week or two, the lure of these book festivals is not as great as it was, say, a decade or two ago. But there is something about being in the midst of tens of thousands of physical books that still holds an attraction. The Bangalore Book Festival, 2010, kicks off from Friday, November 12, 2010, and continues till the following weekend, closing on Sunday, Nov 21 2010. The organizers expect to have more than a million (ten lakh) titles on display, and more than 3.5 lakh (3,50,000) visitors attend the festival over the 10 days it is held. The book festival is open to the public from 11 a.m. to 9 p.m. and the entry fee is Rs 20. Entry is free for school and college students, a press note said. Books on medicine, engineering, indology, architecture, ayurveda, astrology and various other subjects will be on display catering to the interests of all - from six-year old to sixty-year old. Devaru Bhat, secratory BBPA, "To conduct the Book festival in a systematic and hassle free manner, we are ensuring that every detail is taken into account." He further said that, "The event is spread over 75,000 sq.ft is jointly organised by the Bangalore Booksellers and Publishers Association and Klub Class. The Kannada Book Authority has extended its financial support to the fair." The Hindu festival of Diwali, the festival of lights, is incomplete without the bursting of firecrackers. Which means that you want to be handy with a camera in hand. Here are some photos from the celebrations.